Van den Acker pictured with the new Clio subcompact, which embodies the brand's 'Latin sensual' styling. 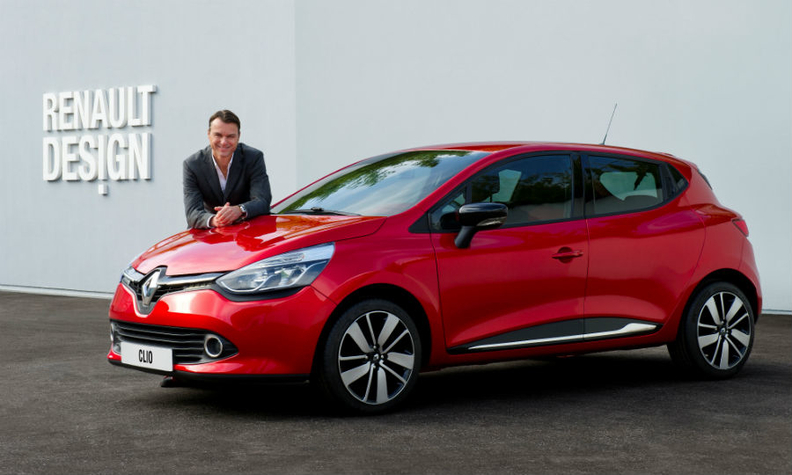 Renault design boss Laurens van den Acker wants the brand's cars to spark a deep emotion within its customers. "If they don’t seduce we're dead," the Dutch-born styling chief said. Van den Acker also told Automotive News Europe Editor Luca Ciferri why designers have a stronger voice than ever inside automakers' boardrooms. How can you make the French-ness of Renaults globally recognizable? When I think about France, I think about seduction. When people go to France they fall in love with the French lifestyle, the French way of living, so first and foremost our cars need to seduce. If they don't seduce we’re dead. My vision is that when people buy a French car, they’re buying a piece of France, hoping to go there on holiday. I don't think that somebody who buys a German car wants to necessarily go to Germany on holiday. This French seduction is unique and this is why I pushed so hard [for the Renault brand] to become Latin sensual, combining the best of the Latin values with some solid values. To me, German cars are cold, Italians are hot, and French are warm. If we have German quality with Latin flavor then we have a perfect combination. I hope that’s what we can express with cars like the Clio, Captur and everything that comes after. Design is more important than ever. What is driving this? This is happening for a combination of reasons. First, design has established itself as a force inside the industry. Automakers realize that they need design to succeed because design remains the No. 1 reason for purchase. Of course, you need to have the substance too, but design is the most important factor. Secondly, technologies and engineering capabilities have increased enormously, so lot of things that we design now can be actually built. Third, I think we are living in a really exciting period for automotive design because we have all these new markets that are opening up such as India, Brazil, Russia and China. People are buying cars for the first time. They have a naive love affair that is just starting with the automobile. This is the same feeling we experienced in Europe in the ’50s and ’60s, when people discovered cars, fell in love with them, aspired to own them. This feeling might be harder to find in Europe right now, but once you go outside of Europe, it’s everywhere. MAIN CHALLENGE: Creating a sensual design for Renault to exploit the brand's French heritage. Are today’s car designers more talented than their predecessors or are they making such great steps forward because they have more freedom? It’s probably a cumulative effect. I wouldn’t say that our predecessors were less talented as there have been great cars made in every decade. Our predecessors had to fight a lot more to get design at the forefront. My predecessor, Patrick Le Quement, had to fight to get a place at the table. Frankly, we now profit. In addition, the understanding about the importance of design has increased within management. So, in many ways, our lives as chief designers have become easier. We don’t have to defend our existence anymore. For years, Renault was a strong believer in customer clinics. If a new model flopped during the trial, designers had to start over. Are clinics still that important to the brand? When we look at the score it is not simply black or white. We try to interpret the results. I keep an open ear and eye to what the research tells us. Luckily, we have had a very good correlation between successful market clinics and successful sales. For instance, the new Clio tested very well and it’s selling very well. The Captur had the best market test in 20 years at Renault and we’ve just doubled its production. Clinics are just one of several factors that decide if a car survives or not. In your five years with Renault have you had a potential new model killed because it scored poorly in clinics? No, but sometimes we’ve needed two or three tries. What does Renault design stand for? I developed a strategy called the Cycle of Life to make cars for every stage in life. When a customer comes into a dealership, whether he has just fallen in love, wants to explore the world, has started a family or wants to reduce his impact on the environment, we have the right car for him. In this circle, we have our sports cars for the fall in love phase, our crossovers for exploring the world, the minivans for the expanding family period and hybrids and electrics. I also want our cars to be warm because we need to be human. I want them to be simple, because we are a mass-market brand.